I recently purchase a 1986 IH 244 with 674 hours. Everything seems to be working great except for the diff.lock. When I push the pedal down it locks, but will not unlock without crawling under the tractor (not running) and persuading the lever with a hammer. It acts like the shaft may be sticking in the housing. I sprayed it with PB Blaster and worked it back and forth for a long time, but got little result. I am guessing that the previous owner did not use it because he only used a finish mower to cut a few acres. Any help or suggestions would be greatly appreciated. Keep working at the linkages. Unless the spring is broken it should loosen up. Many times once engaged they will bind up on the gears. Try hitting or stabbing individual brakes a couple of times. Many times this will releive the pressure enough to let the gears unlock. This may be a bit off the mark, but are the rear tires the same size / similar treadwear? Along the lines of AnnBush post, tire wear may be the same but tire diameter could be different if the pressures are different. Also, try turning the steering wheel to the left and right while going slow. This difference in wheel speed may be affecting it too. I have NH TC33D (HST) with foot-actuated diff lock. The owners manual says to come to complete stop before engaging, otherwise the axle components could break. 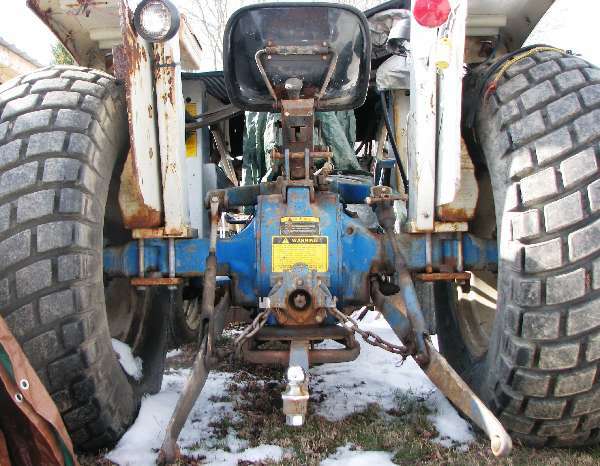 I had a similar problem many years ago with an old 4x4 truck that would not disengage the front axle after use. I had to put it in reverse and back up several feet to unwind the gearing, then it would come out of four wheel drive easily. The tractor may not be set up the same but you might want to try it. Thanks for all the input, I checked and the tire wear and size is matched on both sides, but it still has to be manually disengaged. One of the replies did bring up something else I am not sure of. Is it ok to engage and disengage the traction control while the tractor is moving or should it be brought to a stop?? every tractor is different. Your tractor you can engage on the fly.